Democratic presidential hopefuls turned their attention Thursday to education, offering an array of policy prescriptions ranging from expanding tax credits for college expenses to providing universal pre-kindergarten. At Plymouth State University here, front-runner Hillary Rodham Clinton proposed expanding a tax credit for students and their families to make college more affordable, along with $250 million in grants for colleges and universities that develop innovative programs to boost their graduation rates, particularly for low-income and minority students. Farther south in Manchester, N.H., Bill Richardson used a town hall-style meeting to unveil a $60 billion education plan that he said would provide universal pre-kindergarten programs, scrap No Child Left Behind and make public college free. 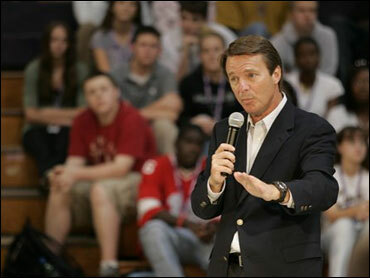 And in Darlington, S.C., John Edwards released a plan to improve rural South Carolina schools, where eight poor school districts have sued, challenging the way legislators fund public schools. Under Edwards' plan, teachers in poor, rural schools would get a raise of up to $15,000 and 4-year-old kindergarten would be available to all children. The centerpiece of Clinton's plan is a proposal to more than double an existing tax credit from $1,650 to $3,500. Students and their families would be able to claim 100 percent of the first $1,000 of college expenses and 50 percent of the next $5,000, Clinton said. "This tax credit is the heart of my plan because I want to reward people who are trying to do better for themselves," she said. The New York senator said there is no guarantee that the United States will remain a great nation with a growing economy if it doesn't do more to make higher education affordable. "Higher education has never been more of a financial burden, but in today's global economy, it's never been more important," Clinton said. "When it comes to higher education, we should not be playing catch-up with the world, we should continue to be leading." Richardson called the education system "broken" and said he would emphasize preventive care for children. Central to that promise is his pledge to scrap No Child Left Behind, President Bush's education plan that focused on accountability and standards for students and schools. "Some say fix it, others say tweak it. Senator Clinton says reform it," Richardson said. "I also have two words for No Child Left Behind: Scrap it. Scrap it. End it." The New Mexico governor said he would pay for the plan by cutting Cold War-era weapons systems, end subsidies to private banks and still have money left over. "The vision I have outlined is bold and comprehensive. It is also expensive," Richardson said. "Unlike the timid plan of others, mine is a $60 billion investment in our nation's future." Part of Richardson's plan is to offer two years of public college in exchange for one year of service; college students would have access to $3.6 billion of free college. Graduates could qualify for up to $24,000 - enough to pay tuition for four years at an average public school. Recent graduates could join the Peace Corps, AmeriCorps or Teach for America to earn back their college tuition. Also, new graduates could become firefighters, police officers or teachers in underserved areas to participate. Edwards, a former North Carolina senator, had previously released some of the proposals contained in his rural education plan. However, his campaign said the six-point plan offered Thursday was repackaged specifically for South Carolina, an early-voting state. Edwards is not the only Democratic candidate to visit schools in a rural South Carolina. In August, Illinois Sen. Barack Obama visited a dilapidated school and said more federal funding was needed. And Clinton's first radio ad in the state referenced the rural schools.